Plate 14 from the first set of Thomas Daniell's 'Oriental Scenery.' The fortress of Ramnagar on the Ganges near Varanasi, with its massive buttresses of the 17th Century, was constructed mostly by Raja Balwant Singh (1739-70) who governed the province of Benares on behalf of the Nawabs of Avadh (Oudh). The rebellion in 1781 of his son, Chait Singh, against the exactions of the East India Company, caused the province to be annexed by the Company. The palace was later returned to the family, who became known as the Maharajas of Benares. 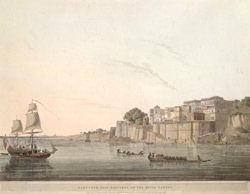 Thomas Daniell and his nephew William may be seen on the left in the aquatint seated on the pinnace budgerow, the boat on which the artists travelled up and down the river Ganges in 1788-89. A state barge in the form of a morpankhi or peacock-prowed gondola has come out to meet them.